Work is excellent for both our mental and physical health. Research has consistently shown that good quality work can boost and protect health. A further positive element of the workplace concerns organisational culture, which can be supportive of mental health and wellbeing. Elements of culture such as management and communication style can contribute to positive mental wellbeing. In addition, positive management practices in relation to such areas as participation in decision making and providing timely and supportive feedback can contribute positively to employee wellbeing. Another vital element is the promotion of a positive health and safety culture. Social support in the workplace is also essential – colleagues can help individuals share, cope with and overcome personal problems. Stress is not always a bad thing. Some stress helps one stay focused, motivated and meet new challenges in the workplace. However, when positive work features are missing or inadequate we find that satisfaction declines at work and consequently mental health is adversely affected. When stress exceeds one’s ability to cope, it stops being helpful and starts causing damage to one’s physical and mental health. ‘Burn out’ is currently a very popular diagnosis which is mostly used in the workplace, particularly by self-diagnosis. People like the diagnosis as it implies an excellent work ethic and makes the experience less personal. Whereas it is an extremely helpful concept, reflecting contemporary unhealthy work circumstances and ways to improve them, it can also sometimes camouflage and distract from the more complex clinical picture of a given client. This means that it is very important that we give each presenting client particular attention to understand their particular psychological profile and differentiate burnout from more serious mental health concerns. •	being inefficient at the work place. At CHS we often see clients who are experiencing stress in the workplace. These clients seek our help at different stages. Some are just starting to feel overwhelmed by work demands; others are bordering on burnout and others come to us when they have already ‘burnt out’ and are physically and emotionally unable to return to work. We try to help them at each stage. Typically we find that many young and ambitious employees will overwork, ignoring work life balance so that work becomes too central. This is often to the detriment of social life and even adequate self-care. Often these ambitious individuals will forgo social engagements, exercise and other necessary parts of daily life in order to work unreasonably long hours. Some work up to 18 hours a day. This is obviously not realistic or even humanly possible to maintain. If you are feeling overwhelmed and exhausted to the point that you are no longer able to make the necessary changes to prevent a crash, you can call CHS to set up a confidential appointment with one of our therapists on (+32) 02 647 67 80. Volunteers on the Community Help Service’s English-speaking Helpline have been providing information and support to the Belgian international community for more than 45 years. 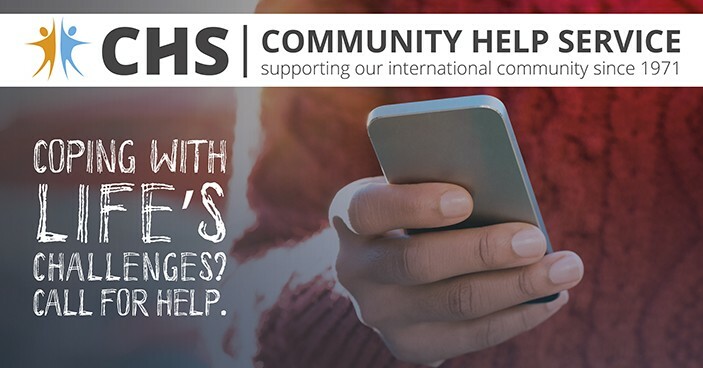 You or someone you know may need support from the CHS Helpline, but CHS now also needs your support. Is there something bothering you or not quite right in your life? Are you concerned about a member of your own family, or a friend, neighbor or colleague? Maybe the issue is clear, maybe not - some people find it difficult to open up and talk about personal problems, even with those close to them. While many people avail of exciting opportunities and enjoy life, others struggle due to problems at work or with personal relationships, alcohol or drug addiction, depression or loneliness, culture shock or bereavement. Unfortunately, the WHO reports that more than one in four people in Europe between the ages of 18 and 65 experience mental health issues. It may therefore be a great relief to know that there is a number to call in Belgium where, anonymously and confidentially, whatever the problem, without charge, 24 hours a day, 7 days a week, someone is available who speaks English and who will listen sympathetically and provide emotional support or helpful information. This Community Help Service (CHS) Helpline can be reached on 02 648 40 14. Please add this number to your contacts and pass it on. For more than 45 years, CHS, a Belgian non-profit organization, has been providing help and support to people in Belgium who find it easier to express themselves in English, regardless of their nationality and circumstances. It also runs the CHS Mental Health Services Centre (at Avenue des Phalènes/ Nachtvlinderslaan 26, 1000 Brussels) for children, adolescents, adults and families, and works closely with international schools, providing psycho-educational assessments for children experiencing learning difficulties. The Centre is virtually self-financing, thanks to financial contributions from the therapists working with CHS. Our Helpline, however, with annual operating costs of more than €30,000, relies entirely on external funding. Unlike the French, Dutch and German-speaking Helplines, CHS does not receive any subsidy from the Belgian authorities. Helpline-related income principally comes from an annual CHS calendar, website advertising, contributions from community associations and fund-raising events. In order to cover the Helpline costs, CHS is urgently looking for 20 or more companies in Belgium each willing to annually donate say €1,000. We are making a direct appeal to AmCham companies able to make a relatively small but highly significant donation that may directly affect the wellbeing of not only their own employees but also many other people working and living in Belgium’s international community. In 2016, the well-respected King Baudouin Foundation (KBF) in Belgium (www.kbs-frb.be/en) set up a 'Friends of Community Help Service Fund' within KBF whereby corporate and individual donors can make tax-efficient donations specifically to support financing of the CHS Helpline. In Belgium, the related tax benefit is 45%, i.e. €450 for each €1,000 donated. KBF in the United States (KBF US www.kbfus.org) also has a ‘Community Help Service ASBL (BE)’ Fund for the same purpose. In the US, since KBF US is a public charity, within the meaning of Sections 501(c)(3) and 509(a)(1) of the IRC, donors may claim the maximum tax benefits allowed by U.S. tax law for their contributions. It has been agreed with KBF that any surplus funds raised above the Helpline operating costs will only be spent promoting the Helpline, e.g. in the Brussels public transport system. Companies or foundations donating €1,000 or more via KBF Belgium or $1,000 or more via KBF US will be thanked individually on our website. Is work too important in your life? Mental health in the work place is the theme for mental health day 2017. But what is mental health in the work place about? We know that much more could be done to improve mental health by management. They should appreciate the limitations of their staff, understand the importance of a work/life balance, regularly express recognition and acknowledgement, invest in structures to improve adequate support, prevent bullying, etc, etc. But what about the employee? What can he do to improve his own mental well-being at the workplace? We work about 8 hours a day, which comes close to a staggering 1/3 of our lives. Work looms large; nothing preoccupies our lives more, so people take it seriously, and for a good reason. We spend more hours working than we spend with our families or sleeping. The hours of dedication and sacrifices that demands the majority of our awaken life have to be meaningful to us and hence job titles have come to define who we are. Work is no longer just something we do to maintain our lives and put bread on the table. It can’t be easily separated from the rest of our life. Our personal identities have to a large extent become defined by our careers. The demands and challenges of work are never ending. It can be intriguing and exhausting. There is competition and the reality is that only a few people will keep advancing. Then there is failure or – fear of failure. What do you do if that sense of inadequacy sneaks in? Devote more time to work, or find meaning and pleasure elsewhere? The majority of people do have a broad identity consisting of various elements like: mother, runner, wife, political activist, singer, etc. But an increasing number only have one identity: their profession. It often starts out passionately and rewarding, but there is a risk that work develops into a compulsion that eventually takes hold of our lives. When your job defines you, your world becomes narrow. When your job defines who you are, everything that happens at work becomes personal. The more we define ourselves through our work and derive our identity from it, the higher the risk of mental health problems, when work falls short of our own expectations. When we can distinguish who we are from what we do, we become less vulnerable. If a colleague or a customer is unhappy with our performance at work, we should be aware that he is questioning our work role rather than us as people, which then makes it easier for us to handle the situation in a professional way. A healthy work-life balance is possible when we recognize and address our compulsion and understand that we exist in a larger context. Think about how you want to be remembered when you’re no longer here? By your resumé or by the strong and meaningful relations you developed by spending time with people, who mattered to you? Meaningful relationships and engaging activities are important. Redefining achievements and accomplishments can be necessary. It is therefore of utmost importance that we know who we are outside work and that we derive pride and pleasure from that. The more we are aware of the fact that we are not our job, the lower is our potential for stress and our risk for burnout; the more enjoyable is our collaboration with others, and not only does our life improve, but so does our performance at work. In brief: while managers are still accountable for mental health in the workplace, the employees may equally contribute to their own mental health by not placing too much importance on work! Community Help Service (CHS) offers a crucial service to the English-speaking community in Belgium. Trained volunteers who have been carefully chosen for their empathetic and listening skills are operating an anonymous and confidential Helpline. They listen without judgement, which can be useful when going through a process of understanding and defining who you are – not just what you do – and helping you to survive the ups and downs of working life. We will be marking World Mental Health Day on Tuesday October 10th and thought you might like to join us! This can be done from the comfort of your office or home as the action will be taking place online. The links are provided below. Throughout the day we will regularly be posting on our website and social media in order to raise general awareness about mental health. We will especially be highlighting ‘Mental Health at Work’ as this is this year's theme. We will also describe in depth what the Community Help Service do on a daily basis. Expect articles, testimonials, therapy explanations, staff introductions, upcoming events announcements, vacancies at CHS and much more! We wish you a peaceful World Mental Health Day and hope that you join us online! - buying our 2018 Calendar, 10 euros.